KUALA LUMPUR (Aug 2): Long-haul low-cost carrier (LCC) AirAsia X Bhd recorded a 27% increase in its passenger count in its seasonally weaker second quarter this year on the back of additional capacity. In a statement today, AirAsia X said it carried 1.03 million passengers in the second quarter of 2016 (2Q16), up from the 810,944 passengers in last year's comparable quarter. The number of seats flown grew at a smaller quantum of 13% to 1.37 million. In this instance, AirAsia X managed to increase its load factor by seven percentage points to 75%. "The capacity injected was well-absorbed with strong demand returned across all regions resulting in passenger load factor (PLF) improving by seven percentage points to 75% against 68% for the same period last year," said the airline in the statement. "Operating performance in 2Q16 has exceeded expectations despite historically being the leanest quarter, as demand returned across all regions on the back of the ongoing turnaround plan initiated last year," it added. AirAsia X, too, increased its available seat kilometre (ASK) by 17% to 6.68 billion in the quarter, from last year's 5.69 billion. Revenue passenger kilometre, the volume of passengers carried by the airline, meanwhile grew by 29% to 5.03 billion. "During the quarter, Malaysia AirAsia X (MAAX) added frequencies on four routes: Kuala Lumpur — Perth, Melbourne, Sapporo and Osaka, boosted by increasing demand. MAAX also added Tehran to its network and took delivery of two A330s in 2Q16, bringing its total fleet size to 23 aircraft," it said. The ASK's bigger growth rate, compared with the available capacity, was also partly because of a 13% increase in the number of flights flown, to 3,638. In 2Q15, AirAsia flew to 3,213 destinations. Average flight length was up by 4% year-on-year to 4,872km in the 2Q16. "Thai AirAsia X (TAAX) recorded a healthy PLF of 89%, an increase of 17 percentage points from 72% a year ago. TAAX introduced two new routes at the end of 2Q16 from Bangkok Don Mueang to Tehran and Muscat while maintaining a fleet size of six A330s," said AirAsia X. Its Indonesian arm Indonesia AirAsia X recorded a 26 percentage points increase in PLF to 75%, despite maintaining its fleet size at two A330s. In total, AirAsia X group of companies' Airbus 330 fleet as at June 30, 2016 was 31, compared to the 26 available at the same time last year. "Following a strong 1Q16, AirAsia X remains cautiously optimistic on its operating performance given ongoing regulatory issues, challenging competitive landscape, currency volatility and other external factors beyond the control of the company," said AirAsia X of its operation's prospects. On its end, AirAsia X said it will continue to strengthen its core markets. This is more so for China, it added, when it recorded an 18% jump in Chinese arrivals into Malaysia from 12 months earlier. 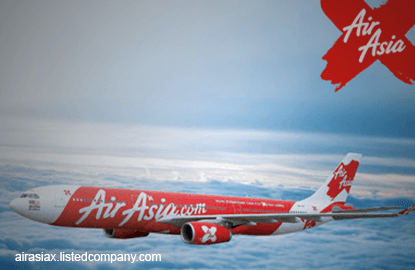 AirAsia X concluded with saying it will explore "other strategic initiatives to ensure sustainable growth going forward". The LCC's shares have gone up by 60% since the end of January this year. At market close today, AirAsia X's 0.5 sen or 1.23% fall to 40 sen a share brought its market capitalisation to RM1.66 billion.